The Commencement – Part 2 | Be The Best. So it’s Saturday. The trauma and drama of the cross is behind us, but now what? Historical accounts indicate a lot of second guessing and doubting about what the future would be without the Son of Man around physically. Sort of like living in a suspended state. We know what Saturday is like. That’s where you live for a long long time. Quite literally as I type this, our dear friends, the Funks, who stood by us like soldiers for weeks and weeks, are in a suspended animation state with their family, specifically, their daughter Jessica (20). As you read this, please offer a thot and prayer for her as she fights a flu-like infection that has forced her into a stable but critical state in a Vancouver area hospital. As a group, we didn’t need any more lessons about how precious life was, but we got one anyways. When it’s Saturday you think…did that thing just happen? to us? really? Did we just lose Chris? really? You can’t comprehend for a long time what actually happened. Saturday is a day where those thoughts can come and topple you over. I don’t know if you remember the blog post back about a year or so ago how astronauts (and others) are trained to compartmentalize their grief and emotions. That’s the only way they can make it through traumatic situations and still land the plane, save people from burning buildings, deal with trauma etc. You can read that post here. I was also struck by the psychology professor commenting on the story indicating that compartmentalization makes sense but it can have severe impacts as well. In other words you can’t compartmentalize forever. So…what does that mean? Saturday is a time when the doubts and questions come…you MUST compartmentalize to keep working, living and moving ahead BUT (and it’s a big BUT – insert your own joke here), if you only compartmentalize, you will pay a HUGE price. Saturday is also for doubting. Saturday is also for questioning. Saturday is for being angry and confused. Saturday is for letting those thoughts come to the door, you answer, chat a minute or two and then close the door. That’s why there is a Saturday. 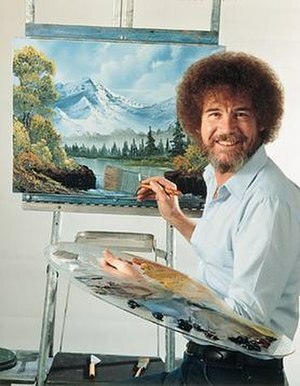 To conclude, the blog post I wrote this past Christmas about Bob Ross the painter, has really stuck with me for months. He’s that quirky public television personality with a cult-like-following who always looked like he destroyed his painting about 3/4 of the way through…only to have the final image always blow you away. You can read that post here. What’s the point you say? Early on in our Saturday, the questions outweighed the answers, the pain outweighed any positive feelings of the future and I couldn’t understand how any pieces fit together. I still don’t, actually, but I do know this. I believe very strongly that we ARE part of a larger painting. We don’t understand all the Master Painter does or is doing. PERSPECTIVE is a thing that is not quite available on Saturday, but even as Satur-day turns into Saturday-night, that perspective grows. And I know one thing…Sunday’s coming. Agreed. Hard to see the painting when you’re actually in it! touched. Thanks for contributing so much powerful food for thought.